According to Does changing the ISO of a modern digital camera really change the gain of an electronic amplifier?, the ISO physically amplifies signal in analogic way, so it is more effective than digital gain as it does not amplify any downstream noise generated by ADC. To understand the relationship between noise level (standard deviation) and ISO, I capture a sequence of dark frames with varied ISO (3 frames for each ISO, and other settings are identical). The dark frames are recorded in a lightless environment with camera lens capped on, thus the std value of a frame should reflect the noise level there. Before I see the real measurements, I expected a sublinear relationship existed between ISO and std value of frame (as pure digital gain should display a linear relationship). Though, my hypothesis maybe right when only inspecting the data with ISO from 400 to 1600, the sublinear function cannot interpret the relationship exhibited in ISO range of 100-400. It is also strange that the black level has been adjusted from 512 to 2048 when ISO >= 400. So, How can we interpret the std value of frame is nearly constant when changing ISO from 100 to 200, and why does black level adjust when ISO >= 400? All data is collected in a canon EOS 5D mark IV camera. I find the following image from http://www.clarkvision.com/articles/iso/index.html seems very relevant with my question, but I cannot fully understand the description there. Based on inspection of your "captured dark frames and their associated statistics" and some experience in document scanner technology, it appears that between ISO 400 and 200, Canon shifted away 2 least significant bits, which represented most of the noise that you attempted to measure. 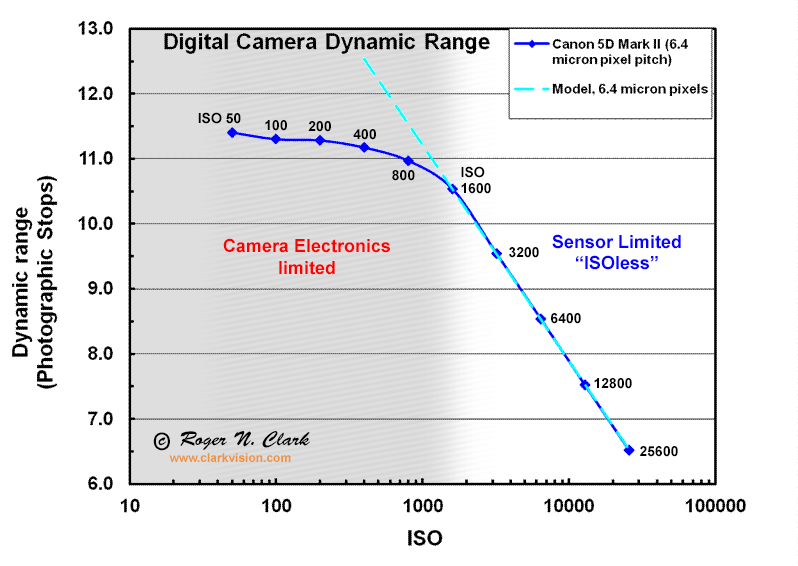 As for Clark's diagram, "ISOless" exposures wanting ISO above 1600 simply lack enough signal from photons to saturate the ADC's dynamic range. Meanwhile, dynamic range for exposures needing ISO less than 200 are nominally constrained by ADC bit depth. My understanding for that dynamic range bump at ISO 50 is a product decision, given that many competitive camera review image comparisons are made at ISO 100, so artificially reducing gain yields cleaner shadows and monochromatic colors. Not the answer you're looking for? Browse other questions tagged raw iso noise dark-frame-subtraction or ask your own question. Why does raising ISO make image quality appear lower even though my measurements suggest it shouldn't? Why is there no image noise in my webcam dark frame photographs?